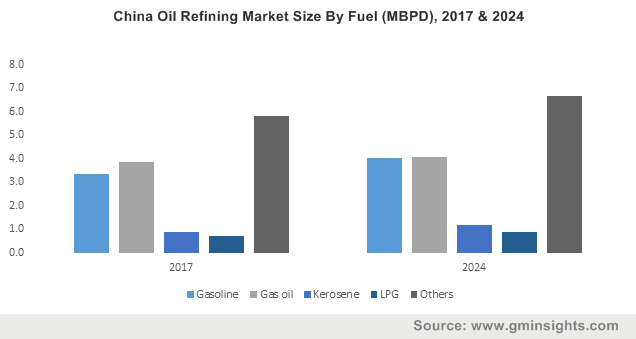 Oil Refining Market size was valued over USD 6 trillion in 2017 and is set to witness a consumption of over 100 million barrels per day (MBPD) by 2024. Oil refining market will witness an appreciable growth on account of rapid industrialization and economic transformation. Changing demographics, growing population and improvement in living standards across developing nations are some of factors positively influencing the industry landscape. Moreover, increasing disposable income owing to rapid urbanization will further fortify the affordability and accessibility of refined products. According to World Health Organization, the global urban population is predicted to grow over 1.5% annually by 2020. Increasing investment toward construction, expansion & upgradation of refineries to fulfill petroleum product demand will stimulate the global market. For instance, in 2018, Chinese investment firm announced to invest USD 2 billion for construction of oil refinery in the northern Mazandaran province. Government regulations pertaining to carbon emissions along with positive outlook towards aviation and road transportation sector are some of the factors augmenting the demand for refined products. According to OPEC, global diesel demand is anticipated to grow 10 million barrels per day by 2030. In 2018, International Maritime Organization (IMO) has set target to reduce the carbon emissions by 50% by 2050 under new international agreement. Topping oil refining market will witness robust growth on account of its ability to crack larger molecules into smaller ones and transform it into high value-added products. Growing demand for petrochemical feedstocks and industrial fuels will further complement the business growth. Conversion oil refining market will witness growth on account of its ability to eliminate the production of residual fuels. Permit the economic use of sour crude oils, maximize yields of transportation fuels and provide operating flexibility for light product output in the face of normal fluctuations in crude oil quality are some of its benefits which will make its adoption preferable. Deep conversion segment is anticipated to reach over 40 million barrels per day by 2024. Introduction of several regulations pertaining to product quality specifications will fuel the business growth. For instance, according to IMO from January 2020 fuel oil used on ship boards should not consist of more than 0.50% m/m (mass by mass) of Sulphur. 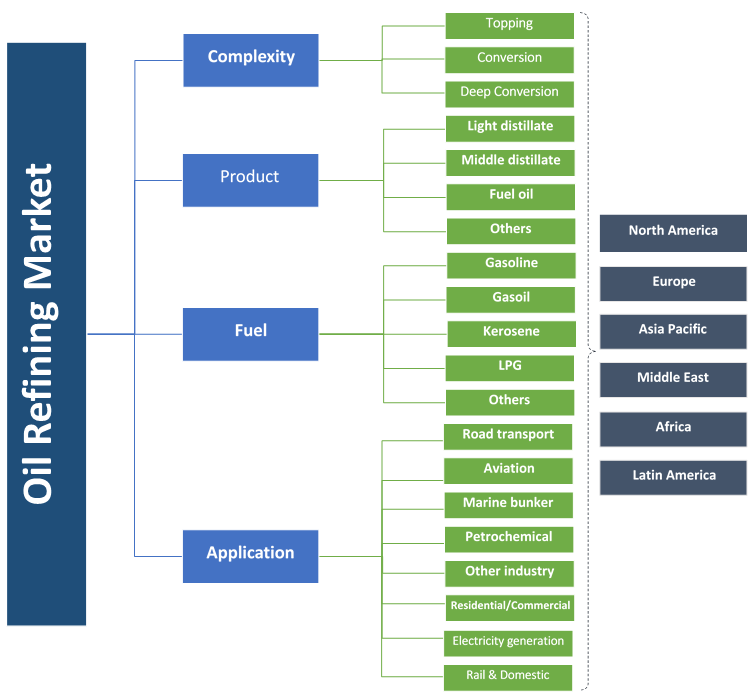 Light distillate oil refining market is anticipated to witness significant growth owing to expanding middle class population coupled with rising disposable income. It finds wide application across healthcare, transportation, petrochemical, residential, manufacturing and automobile sectors. Middle distillates in 2017, accounted for over 30% of global market share. It offers flammable liquids with between ten to twenty carbon atoms and shorter carbon chain compared with light distillates which make its adoption favorable over other alternates. The product finds wide application across commercial and industrial sectors including aviation, power generation, and marine bunkers. Growing demand for air travel along with economic growth and lack of availability of aviation fuel substitutes will further complement the industry growth. LPG in 2017, accounted for over 6% of global market share. Growing demand for feedstock to produce the chemical components including butadiene, propylene and ethylene from petrochemical industries will propel the industry growth. It also finds wide application across residential and commercial sectors for cooking purpose. Gasoline oil refining market will escalate owing to its lower price along with increasing number of global fleet of vehicles. According to world oil outlook 2017, the global passenger car fleet was increased from 491 million in 1990 to 1,076 million in 2016. It finds wide application across automobile and power industries. Petrochemical segment is predicted to witness significant growth subject to growing demand for packaging from manufacturing industries. Surging urbanization along with growing disposable income will further complement the industry growth. Electricity generation, in 2017 accounted for 5% of the global market. Increasing adoption of power plant to suffice the demand for electricity primarily from developing nations and rising focus toward electrification programs will propel the industry growth. For instance, in 2018, Government of China announced that Chinese companies will build three power plant with total capacity of 3,960 MW in Bangladesh. China oil refining industry is projected to witness prominent growth on account of rising demand for petroleum product favoured by rapid industrialization. Growing concern to reduce the import dependency across developed economies will further propel the business landscape. In December 2017, China exported 1.6 million barrels per day which was 6.6% higher from November 2017. Iran market is anticipated to reach over USD 100 Billion by 2024. Growing investment toward development of downstream processing infrastructure will propel the industry size. According to Farnaz Alavi, Director of Planning and Development for Iran’s National Petrochemical Company, the country will spend approximately USD 60 billion in over 25 petrochemical projects to boost its domestic capacity from 60 mmtpy (Million Metric Tonne Per Year) in 2017 to 160 mmtpy by 2025.
Notable industry players across the global market include Indian Oil, Bharat Petroleum, S-Oil, Hindustan Petroleum, Saudi Aramco, Kuwait Petroleum, Abu Dhabi National Oil Company, Fluor, BP, Chevron, Shell, Exxon Mobil, SINOPEC, PBF Energy, Phillips 66, Reliance. Several inorganic growth venture strategies have been witnessed in the industry to enhance its market penetration. Oil refinery transforms crude oil into more valuable products including gasoline, naphtha, LPG, gasoil, kerosene, jet fuel and fuel oils. Based on complexity level the refinery is segmented into topping/ hydro skimming, conversion and deep conversion.